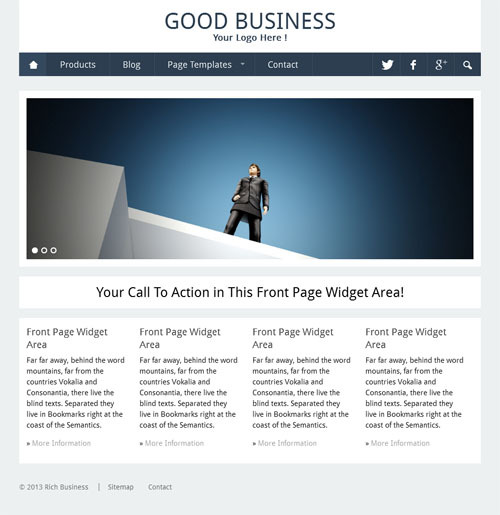 Good Business by RichWP is finally a complete advanced business WordPress theme package with flat design. The theme is made to support corporate style web culture while still maintaining professional look to display different images and information. If we compare this business template with other RichWP themes then we can say it’s combination of all previous and some new features which were missing. The menu bar shown below header is highlighted with colorful panel, this small change makes whole theme look dashing. Color scheme is a dynamic element that you can change any time according to your logo color or business owners preference. Being partitioned in two part, homepage is little bit editor based and more widget based for optimum customization. 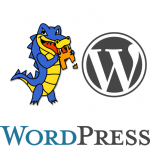 Good Business WordPress Theme makes your homepage turn to any type of look that is needed. Every business makes their own unique identity using logo and to attached this brand symbol header section is available, browser for the logo upload process is given in the admin section. Position of the logo is set to be centered as no advertisement banner is used and below that you may add a small line of slogan to add business quote. Default color scheme and fonts used are quite better but for the customization you will get list of fonts face and color picker tool in the back-end side. RichWP Good Business Theme makes use of unused space on menu-bar (right side) to place icon buttons for popular social media sites, search box, feed etc. The icons consumption less space and makes symbolic visibility to understand what function it will serve, and that’s what is done here. Homepage is the major part of this theme where big slider is placed to only showcase main items and four service columns to write about special expertise or company details. Slider is believed to be best part to highlight images or posts at your own way with built-in options to add custom title text, details, style and interval to automatically move slides. Call to action single row text line is put under slider, it’s good idea to write a single line that may speak thousand positive words about your company. The responsive and light weight Good Business Theme structure can adapt to any latest devices and also on the big screen resolution of PC or laptop. Moreover product page will also load quickly as the advanced code which is residing in the core will use it’s real power. 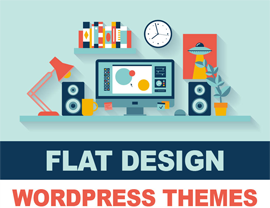 The flexible design makes use of widget on homepage, sidebar, footer and any other areas where widget is allowed. Widget automatically brings content into the view itself according to it’s functionality and to add address or custom text there is a simple text widget available to write anything. The communication function is powered using contact page with custom form to get messages or inquiries from the new clients, once they submit message it will automatically reach to your email box. In-short with the one time payment you are going to get a package that is made fir every business and use the same on multiple websites too.